As my regular readers know, Friday and Saturday of this weekend were spent in a contentious card battle with my daughter and her husband. Friday’s engagement kept us ‘old folks’ up until midnight. Saturday’s campaign continued through to 1am. That is really late for us. There may also have been some beverage containing alcohol which may have been consumed. At any rate, I slept really, really well. Apparently better than Mr. Vixen. 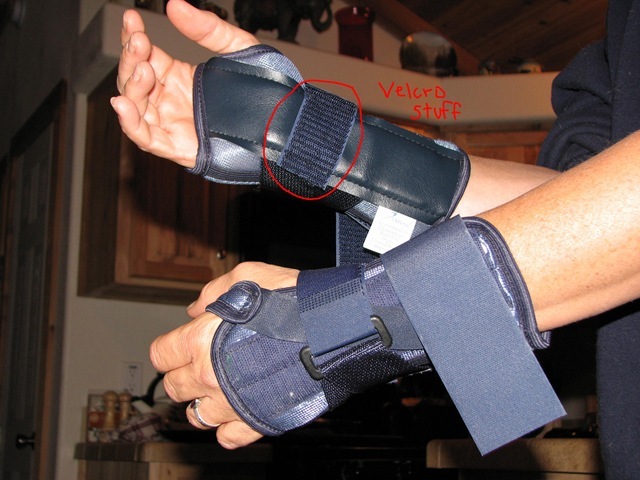 A week ago, my doctor ordered me to wear dual wrist braces each night. Mr. Vixen is a long time sufferer of sleep apnea and has been on a breathing machine at night for years. Last night, he awoke with the disconcerting feeling that he had suddenly grown a third arm and it was attached to the side of his face. He struggled to remove it and found it quite difficult. As he fully came to his senses he realized it was my arm attached to his face. It seems that I put my arm around him and my Velcro stuff attached to his Velcro attachy stuff and we were joined. I never woke up, not even when he had to rip apart our unnatural attachment. It’s A Holiday. Wait it is? Oh it is, just not for me. So you people are so old you are going to kill eachother with all your old people devices? Awesome. P.s. 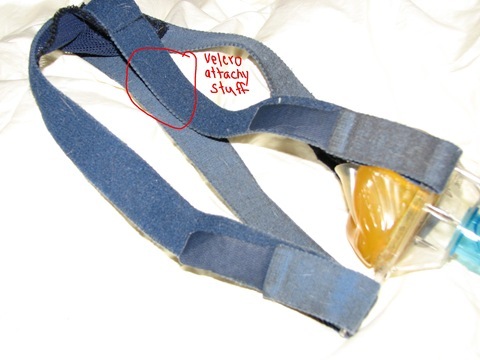 I love the writing on the pictures pointing out the velcro (especially how you’ve labled it velcro attachy stuff, made me lol). i love this story. you are like the kids who’d get your braces stuck together while kissing but 30 years later. hee. I am laughing so hard right now! I love sumgirl’s comment. Awesome. Thats funny! Glad you got a good nights sleep out of it at least!! The two of you have just given “sticking together” a whole new meaning!